NEW ACCELERATED COACHING SESSIONS are planned for public relations pros seeking their APR and for student candidates looking to earn the new Certificate in Principles of Public Relations. Setting yourself apart from dozens or — in some cases — hundreds of other job candidates is a challenge. Fierce competition necessitates you demonstrate a superior knowledge of universal public relations principles. 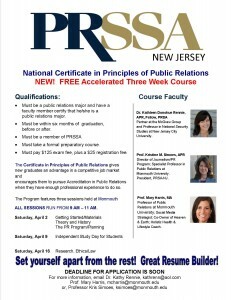 Adding the Certifi cate in Principles of Public Relations to your resume is the leg up you need to secure the position you want. Professionals seeking to earn the APR must have at least five years of professional experience. Students seeking the Certificate in Principles of Public Relations must take the examination six months before OR after graduation. If you are interested in attending the 2016 sessions, please email Dr. Rennie at krennie@njcu.edu before March 1, 2016. The NJ Coaching Sessions include three meetings. All sessions are held at Monmouth University in West Long Branch and run from 9 am – 11 am. Be a public relations major or major in a related field and have a faculty member certify your major (see application on line/link below). Be within 6 months of graduation (before or after). Be a member of PRSSA or be an affiliate member (if your campus does not have a PRSSA Chapter). Take a formal preparatory course. Pay $125 exam fee, plus a $25 registration fee. The best way to prepare for the Coaching Sessions is to review Cutlip, Center and Brooms’ Effective Public Relations, as well as the other books listed at the PRSA.org site (key word: accreditation). Readiness Reviews will be scheduled as needed.